Teach With a Purpose, LLC, an innovative educational software company, announced today that it has officially launched a new website. According to Tristan Putman, COO and founder, the new website and brand refresh are more closely aligned with the company’s strategic vision for growth and expansion over the next decade, and beyond. “We have been steadily improving our software and solutions over the last 10 years by listening to teacher feedback and building relationships with our Schools and Districts." Tristan commented. “We recognize the importance of constantly innovating and adapting to new ways of doing business and technology and the importance of creating software that allow teachers to spend less time planning and more time teaching." The new website offers a clean, modern design, easy-to-navigate functionality, and a content-rich site experience. 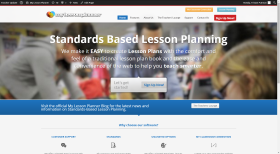 The core lesson planning functionality still enables teachers to quickly and easily plan their lessons. The new website will also provide social media integration and direct links to the My Lesson Planner Facebook, Twitter, and YouTube pages, where software updates will appear on a regular basis. Look for those features soon.